View of Brownsea Castle, the Seat of Chas. Sturt, Esq. bl.uk > Online Gallery Home	> Online exhibitions	> King George III Topographical Collection	> View of Brownsea Castle, the Seat of Chas. Sturt, Esq. View of Brownsea Castle and village on Brownsea Island which lies in Poole Bay in Dorset. The castle was begun as a Tudor Blockhouse, built in 1547-8 as part of Henry VIII's fortifications of the south coast. It was developed into a domestic residence by William Benson. By 1762 had been acquired by the Sturt family of Dorset. 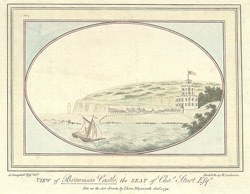 In 1786 it passed to Charles Sturt who decided to make Brownsea Castle his permanent home. In the 1790s war with France, Sturt was appointed Captain of the Brownsea Island Artillery Volunteers.